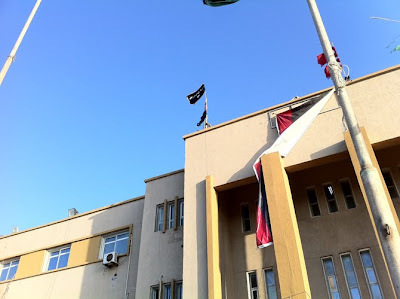 Image - The flag of Al Qaeda flying over the courthouse in Benghazi. Why no announcement on the news that nukes have been found in Libya ? The outgoing premier of Libya's NTC, Mahmoud Jibril said Sunday that nuclear weapons were found in the country, according to the Al Arabiya TV network, Israel Radio reported. Jibril also said that the International Atomic Energy Agency (IAEA) will provide further details on the weapons found in the next few days, according to the report. 2) was it Israel, South Africa ( the Thathcer / David Cameron nukes) or North Korea ? 3) why didnt Gaddafi use them if he was such an evil monster ? 4) what will Al Qaeda do with them now they control Libya ? 5) why arent the media in the West mentioning this incredible announcement ? 6) Have the Islamists who run Libya got hold of a nuke and thereby creating a pretext for a massive attack on America / UK / Europe to act as the pretext for imposing martial law as the global economy crashes ? 7) will we soon see a massive nuke attack / false flag attack ? According to one Benghazi resident, Islamists driving brand-new SUVs and waving the black al Qaeda flag drive the city’s streets at night shouting, "Islamiya, Islamiya! No East, nor West," a reference to previous worries that the country would be bifurcated between Gaddafi opponents in the east and the pro-Gaddafi elements in the west. Whether or not it is planned to use these weapons, the threat of them will be a good incentive for the new regime to formulate an armed invasion of Israel. I believe that possibility should be closely monitored. Gaddafi no doubt loathed Israel but it appears he wasn't disposed to invade. The situation is now different.